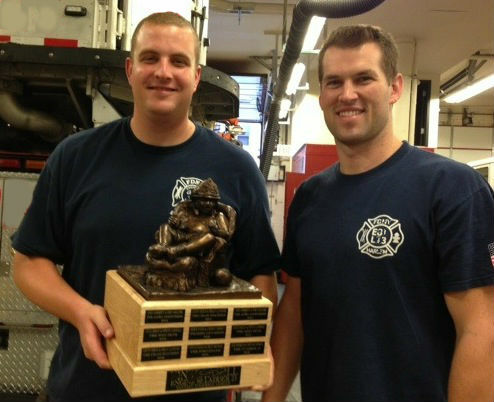 Having a fantasy football trophy specifically designed for firemen has always been something that I’ve thought about. This year it became a reality. A few weeks ago I was contacted by a fireman down in Florida who was wondering if I could add a firefighter’s helmet to the Throwback with his engine companies number on it. I decided to give it a shot. When it was finally completed, I was so pleased with the result that I knew I needed to add a similar helmet to the Armchair Quarterback. Fate pushed my hand. It was only a few days after finishing the Throwback that I received and order from a firehouse in NYC for a regular large Armchair Quarterback. I knew it was for a firehouse because of the name they wanted engraved on the main plate. It had both the engine and ladder company numbers. I gave Dan, a fireman at the station, a call and asked if they’d be interested in having an Armchair Quarterback trophy with a fireman’s helmet instead of the customary leather one. Dan was thrilled with the idea and said he’d was going to surprise his league with the new trophy. A perk for me was the fact that I was able to arrange a day that I could hand deliver it myself to the guys at the station. Let’s face it, who doesn’t want to visit a NYC firehouse? It’s rare that I feel short in an environment, being that i’m 6’2″, but this was definitely one of those rare times. Dan and a bunch of the other guys towered over me. Dan unveiled the trophy and the guys couldn’t have been happier with the result. The fireman’s axe next to the recliner was a small detail that they really seemed to like. Overall the entire experience was just as rewarding for me as it was for them. Now I just need to get both trophies up on the site. Thanks for the photo guys. PS- Thanks for the photo guys.